Larry King, Piers Morgan…Sam Grotewald? Sam Grotewald of the New York Road Runners continues his bid to take the Larry King/Piers Morgan chair at CNN with another good interview in the NYRR’s “On the Run” podcast/radio series. NYRR yesterday posted an great conversation between Sam and Diane Nukuri-Johnson (ASICS) in New York City in the aftermath of Diane’s 69:12 National Record and second-place finish at Sunday’s New York City Half-Marathon. 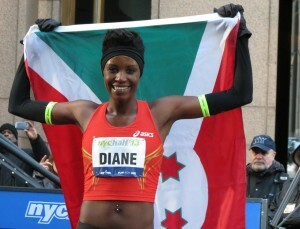 Sam does a nice job chatting with Diane about her experiences running as a woman in Burundi and competing as a 15 year-old in the 2000 Sydney Olympics, where she also crossed paths with Bernard Lagat and Abdi Abdirahman. Diane also reflects on the steps to leave Burundi behind for Canada and then America, and the long-time support given her by University of Iowa’s Head Coach Layne Anderson. She and Sam also talk about Iowa and Diane’s expectations for next month’s Boston Marathon. The 24-minute podcast is available free at this link. Click on Episode 15.